The 2012 GMC Terrain Review: GMC has long been known for heavy-duty work trucks and big, thirsty, V8-powered SUVs. It's interesting, then, to see the red GMC logo and tough-truck styling on a vehicle that gets 32 miles per gallon. The 2012 Terrain has all the rugged, Paul Bunyan looks you would expect from General Motors' macho brand, a tall roofline, imposing grille and wide, squarish fenders, but it's actually built like a car, which means it gets surprisingly good gas mileage. The Terrain is GMC's smallest vehicle, although it's hard to call it small. It offers more space than most mid-size crossovers, including a generous cargo hold in the back, and big, roomy, truck-like bucket seats up front. It tries hard to live up to the GMC brand's pickup-based roots. From the driver's seat, though, there's not a hint of truck DNA. It drives much like a sedan, with a smooth powertrain, nimble suspension and responsive steering. It has a high seating position that offers good forward visibility. Two engines are offered: a 2.4-liter four-cylinder that makes 182 horsepower, and a 3.0-liter V6 that makes 264 horses. Both are mated to a six-speed automatic transmission that's geared to save fuel. Personally, I'd choose the smaller engine because it gets far better mileage. The four-cylinder is rated for 32 mpg on the highway, compared to 24 mpg with the V6. People who want more power, or do serious towing would be better off buying the bigger Yukon with its traditional body-on-frame design and V8 engine. A lot of cars are focusing on entertainment and connectivity recently, so it's good to see GMC add the IntelliLink system to the Terrain for 2012. IntelliLink lets you control your phone, radio and MP3 player using voice commands, and it also lets you stream music online from Pandora using your smartphone. iPhone addicts should be happy to pony up the extra $100 for the privilege. The new stereo system in the Terrain is a big upgrade. It looks and functions similar to the entertainment systems in luxury brands such as Lexus and BMW, using a touch-screen interface with icons to control all the functions. It's actually easier and more intuitive to use than similar systems from either of those luxury brands. Another plus is the level of standard and available equipment you can get. A rear-view camera, satellite radio and USB audio capability all come at no extra charge. You can plug in a USB drive into the car, and the Terrain will start playing your audio files directly from the drive. It works seamlessly. You can also get it with a power liftgate and a remote starter that's perfect for warming up the car on cold mornings. Pricing starts at $26,385 for a basic SLE-1 model with front-wheel drive and the four-cylinder engine. It tops out at $33,835 for the luxurious SLT-2 trim level with all-wheel drive. Denali trim level, which isn't available on 2012 models. Much like the bigger Acadia and Yukon Denali models, this high-end package will include leather seats, huge wheels, mahogany wood trim and enough gadgets to make it feel more like a Cadillac than a GMC. It also will include a 301-horsepower V6 engine, GM has announced. What was tested? 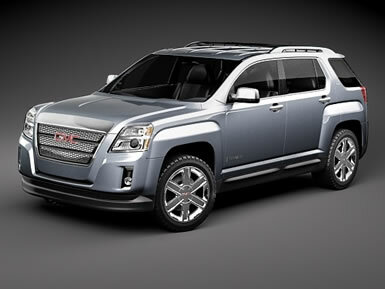 The 2012 GMC Terrain FWD SLT-2 with a base price of $31,260. Options on the test vehicle: The Cargo package for $235, the V6 engine for $1,500, the trailering package for $350 and the IntelliLink connection package for $100. The total MSRP price as tested including the $810 delivery fee came to: $34,255. Why avoid it? The squarish, SUV-like body style is starting to look dated, and the 2013 Terrain Denali is just on the horizon for luxury shoppers.